Spirits were high as volunteers welcomed thousands of guests to the Salvation Army's Christmas Family Feast in Milwaukee. Organizers expected to serve about 8,000 people for their 29th year. Carrying a tray of food, Jonathan Eder said he has been volunteering at the feast for years. "It's a small thing we can do for people that are less fortunate than us," said Eder. "It's nice to see people have a place to go on Christmas. 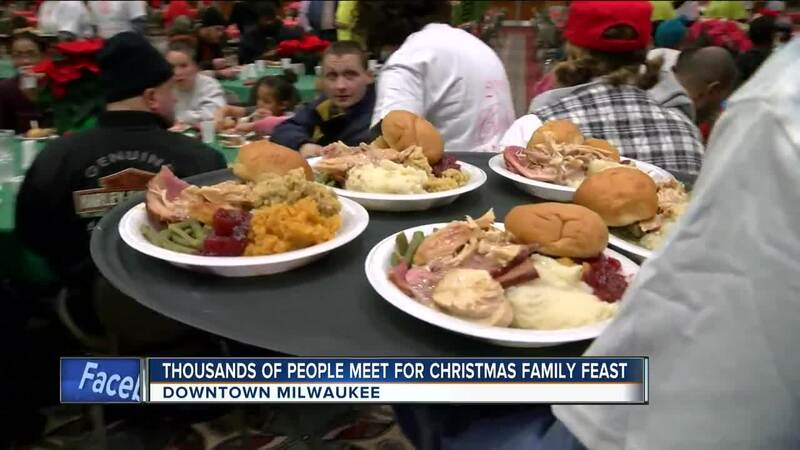 No one likes to be alone on Christmas so it's nice that people can come as strangers and leave as friends," said Amy Burke, Media Relations Director with the Salvation Army Milwaukee. It takes about a year of planning to pull off the organization's biggest Christmas event in the country, hard work organizers and volunteers were happy to put in. "There is a visible joy when people are here, a visible joy of not only having a nice meal but being included amongst peers," said Eder. "It's hard to even put into words because you see the smiles on people's faces. People come with their families. You see little kids running around," said Burke. The hard work was not lost on the guests. It was what Violet Verhein thought about when she walked in Tuesday. "It makes me thankful for what I have and that I'm able to do this," said Verhein.